I doodle pretty compulsively. Despite what people generally seem to think at the time, doodling means I’m listening; it’s a way to quiet down the brain to focus on things, a simple distraction ploy to corral a mind that tends to be unruly. When I doodle, there’s lots of car-related stuff that comes up again and again, and I bet I’m not alone. That’s why I want to know the goofy car crap you draw, almost without thinking? Tell me! For me, if I just doodle without thinking, I’ll almost always end up with fussy little pictures of Volkswagen Beetle taillights, bumpers (both the more ornate pre-’68s and the later ones), bumper brackets (man, why? ), and headlights. It just sort of happens. There’s other recurring things, too—old, generic ‘20s-era looking car fronts, almost always drawn from the same 3/4 view, robots in cars, car cutaways, and so on. Those rough doodles you see up top just came from the margins of the notebooks closest to me; there’s so much more of the same on almost any scrap of paper in arm’s reach. The pear with legs is less common. This grocery-bag doodle became a bit more because I happened to have some chalk with me. But that’s rare. Sometimes a doodle will become a full drawing, but not often. Usually, they just cram themselves tighter and tighter on the page, getting more and more cluttered and illegible. 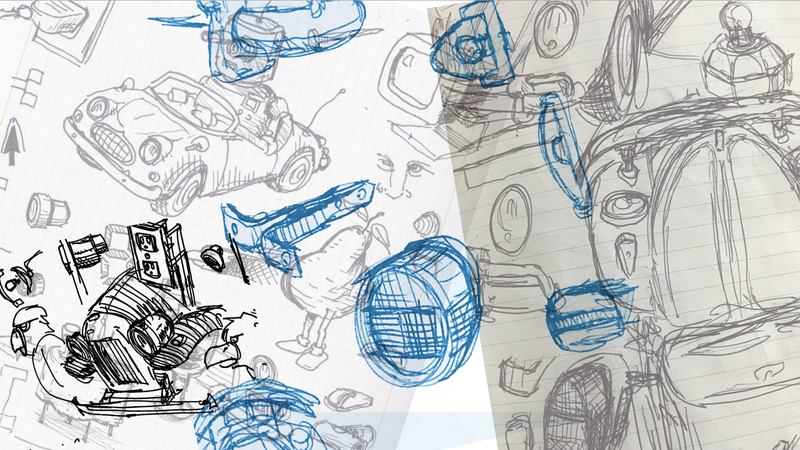 So, what I want to see is what car stuff do you doodle repeatedly? What little details show up over and over again? What shapes just flow into your pen when your mind wanders? Take The World&apos;s Hardest Abstract Expressionist Car ID Quiz!